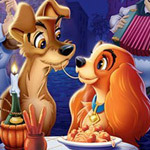 Lady and the Tramp earned is place in pop culture with the iconic spaghetti scene, where romance was kindled between two dogs. The movie may not have as much drama or adventure of Disney’s fairy tale movies, but 50 years after its original release, this story of canine lives still oozes charm. To mark the 50-year milestone, Disney has released Lady and the Tramp on a two-disc DVD set, with a bunch of extras meant mainly for its adult fans. Lady is the cocker spaniel who lives a comfortable life with her owners, Jim Dear and Darling. She’s the apple of their eyes until the arrival of a new baby. Her life is further disrupted when her owners go away, leaving the baby in the care of Aunt Sarah, who is not a dog person. When Aunt Sarah tries to muzzle Lady, the dog runs off in a panic and into the life of Tramp, the streetwise, happy-go-lucky mutt who lives on the wrong side of the tracks. Tramp is the perfect scruffy knight in shining armor for the lady in distress. After getting her muzzle removed with the help of a friendly beaver, a night of romance ensues. Rounding out the cast is a lovable group of supporting dogs, from Jock and Trusty, Lady’s purebred neighbors, to the less pretentious gang at the pound. The only sour note in the movie comes from Aunt Sarah’s two Siamese cats. As the movie’s villains, their devious nature is appropriate, but their buck teeth make them an offensive caricature of Asians. Ethnic stereotypes are used for many of the other dogs, but none have exaggerated physical characteristics. The story of Lady and the Tramp may not be as ambitious as Disney’s Sleeping Beauty, nor does it have the visual flights of fancy of Bambi or Dumbo. The movie has enough dramatic tension and interesting characters to fill 75 minutes without ever feeling padded. Overall, it’s a pleasant viewing experience for all ages. All of the special features are on the second disc of the set. The longest of these is the 50-minute Lady’s Pedigree: The Making of Lady and the Tramp. Lady and the Tramp was one of the few Disney features that was based on an original story, rather than on a fairy tale or a book. In the late 1930s, Disney animator Joe Grant developed the story, inspired by his own springer spaniel, named Lady. Grant would leave the studio in the 1940s, never getting credit for his work on the story. The feature goes on to cover every aspect of the making of the movie, from early sketches to the voice talent. Finding Lady: The Art of the Storyboards goes beyond Lady and the Tramp to give a lesson about storyboards (a series of sketches depicting the action of a film, used in preproduction to help guide the actual production). Disney Studios invented the concept of storyboards in the 1920s, and they have since become a staple in making both animated and live-action films. The Art of Storyboards also has Disney animators Eric Goldberg (Pocahontas) and Burny Mattinson (Aladdin) recreating a storyboard pitch, in which they tell the story of Lady and the Tramp, using an early written treatment of the movie and storyboards from 1943, complete with distinct voices for the different characters. Of the shorter extras, one of the most entertaining is a segment from the Disneyland television series, which features a performance by the vocal quartet The Mello Men, who performed the pound dogs’ howling song. Your Inner Bark is a personality quiz, which tells you which character you resemble the most. Lady and the Tramp was the first feature-length animated film to be made in CinemaScope, with an aspect ratio of 2.35:1. Because many theaters weren’t equipped to show the widescreen movie, a second version of the film was shot in the old 4:3 ratio. Both versions are on this DVD set. The film was restored and the colors are vibrant and look great on a television screen. Viewers can choose between the original theatrical soundtrack, which has also been restored, and Disney’s Enhanced Home Theater Mix. The enhanced soundtrack sounds very good in a home theater, though there wasn’t much surround sound. Many of Disney’s recent releases of animated films come with a feature called Fastplay. It allows viewers to skip the menu and dive right into the movie. Unfortunately, it doesn’t skip promos for other Disney films and video releases; this DVD had five that had to be skipped before the movie began. Starting the movie from the main menu allows viewers to avoid the previews. In fact, it’s just as quick as using the Fastplay option. Also, this option assumes that viewers will want to watch the full screen version of the movie. Anyone preferring to watch the wide version will have to start at the main menu.